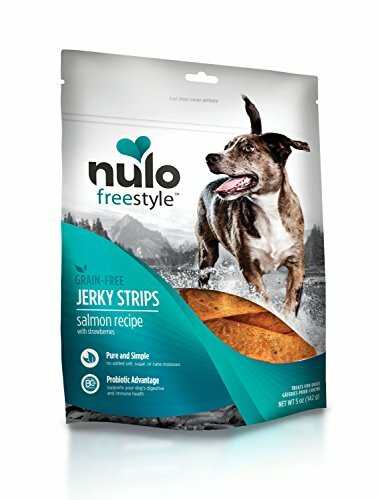 Nulo’s Freestyle jerky strip dog treats are super tasty and help protect your pet’s health - talk about a win-win! Dogs will love the rich taste and irresistible aroma of our smokehouse-cooked beef, chicken, duck, salmon and turkey, and you’ll appreciate all of the high-quality ingredients that go into each recipe. Like you, we want to help your furry friend look and feel their best and stay by your side longer! Our soft and pliable jerky strips are perfect for obedience training, rewarding everyday good behavior or even just because your pup did something cute. Their soft texture allows for easy tearing so you can rip off small pieces if you don’t want to serve your animal the whole strip. Single animal protein sources make the Freestyle jerky strips deliciously meaty. To preserve the pure taste as well as your pet’s health, we don’t add salt, sugar or cane molasses. Each jerky recipe has up to 92% meat along with nutrient-rich fruit and vegetable inclusions. Choose from salmon with strawberries, duck with sweet potatoes and plums, chicken with apples, and beef with coconut. As your pet ages from a puppy to an adult, gut health becomes increasingly important. We include the patented GanedenBC30 probiotic in our treats to provide your furry friend with the proper digestive and immune support they need to live long, healthy lives. Our grain free jerky treats were formulated without wheat, rice, oats, corn, and barley to be ideal for all dogs, including those with allergies and food sensitivities. The reduced carbs also help with weight control to keep your pup lean and active. Manufacturer: Nulo Pet Food, Inc. Publisher: Nulo Pet Food, Inc. Studio: Nulo Pet Food, Inc. If you have any questions about this product by Nulo, contact us by completing and submitting the form below. If you are looking for a specif part number, please include it with your message.